Who said martini? No one. 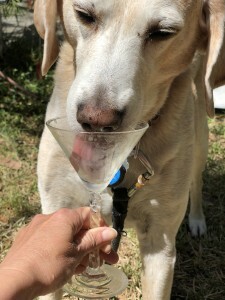 We have a barktini of sorts…a KeiFURtini for dogs! So. Kefir. What is it? Kefir or kephir, alternatively milk kefir or búlgaros, is a fermented milk drink that originated in the Caucasus Mountains made with kefir “grains”, a yeast/bacterial fermentation starter. 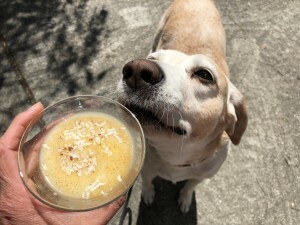 Why is kefir so good for your dog? Kefir’s packed with probiotics, which can help maintain a healthy gut. It’s particularly beneficial for dogs taking antibiotics, which can destroy some of the good bacteria in the belly. Also, pet foods can contain up to 70% carbohydrates. 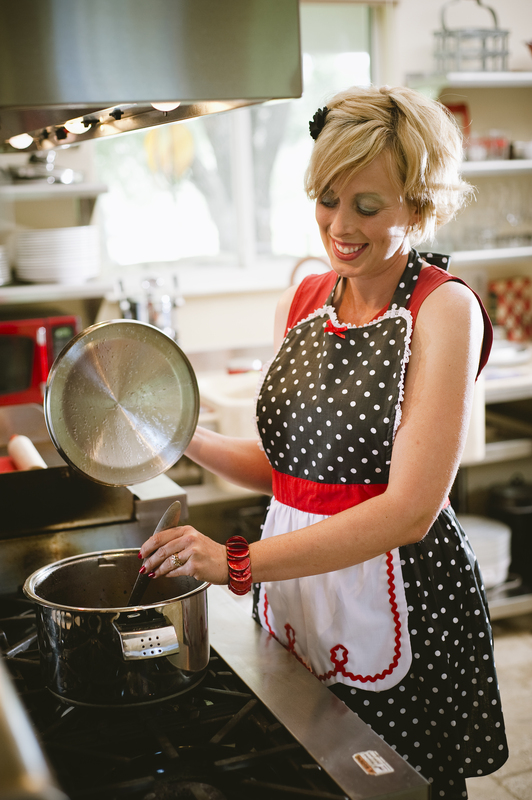 These carbs are broken down to sugars, which then fuel the yeast in your pets’ bodies! Too much yeast is NOT a good thing. Kefir attacks that yeast. But how much kefir should your dog drink? It’s always best to begin small and see how your dog’s digestive system reacts to kefir. Try starting with roughly 1-2 tablespoons daily for every 16 pounds of your dog’s weight. This KeiFURtini is a wonderful way to start and a simple way. But where do I find kefir? You can of course make your own by buying starters. But if not, look at your grocery store’s yogurt or milk section. And always pick the organic for the best quality and benefits. Pour kefir, bone broth and coconut oil into a drink shaker. Shake it up for about 10 seconds. Pour into a bowl or yep. A martini glass if you hold it! Sprinkle turmeric powder and cinnamon powder on top. 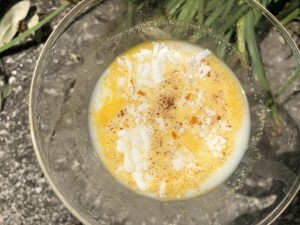 Top with coconut flakes and serve! You are now a barktender!